Today we’re taking a trip. 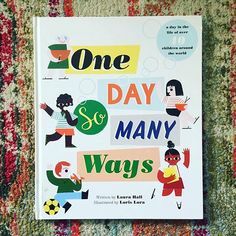 I have a guest post for you from the fam. My parents are undoubtedly The Three Bite Rule’s biggest fans. They took a trip to Charleston, SC and had some really great food. Sis and I went a few years ago (seen here and here) and I’m happy to introduce the ‘rents and the meal they wanted to share! Here we go! 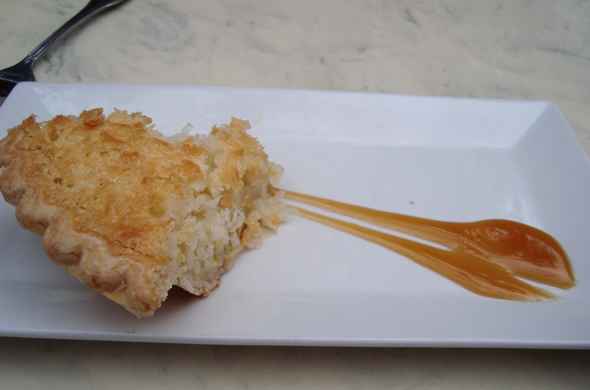 Spending a few days in Charleston, South Carolina, we found many quality restaurants at varied priced points. After sampling a few modestly priced, down-home type establishments, we opted to go a bit upscale on the last evening in the city. 82 Queen became our destination. Located in what was formerly a plantation, the restaurant has an unusual arrangement. We were able to be seated in the courtyard. The personable, attentive waiter offered numerous suggestions as well as copious details about the most popular dishes. He was extremely knowledgeable about each item on the menu. 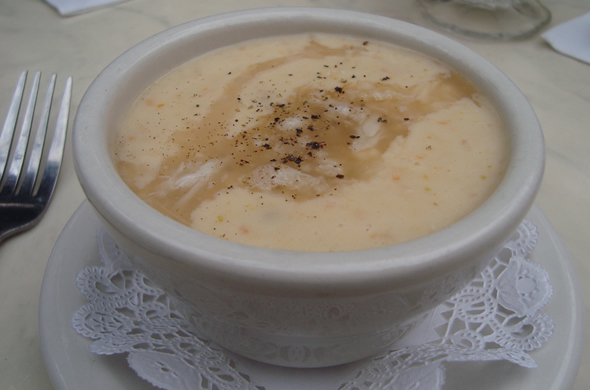 The She Crab soup typically wins Best of Show at Charleston taste fests. 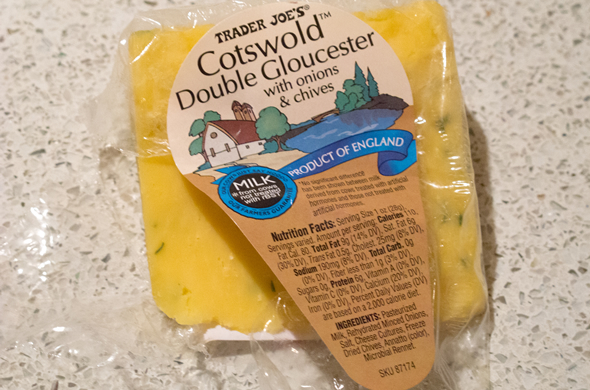 He described it as having the consistency of a chowder with the feel of a bisque. It was outstanding choice served with a bit of sherry to be mixed in at the last moment. 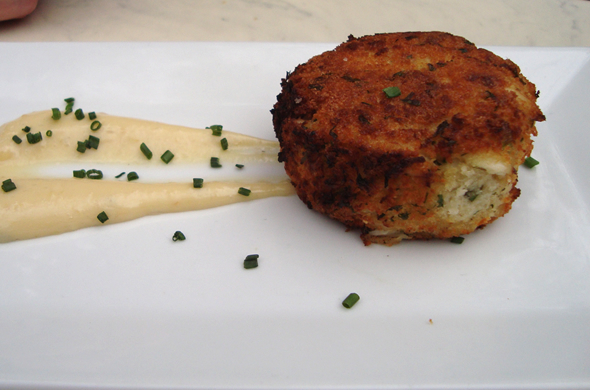 We also chose the crab cake appetizer which the waiter said was 95% crab with just enough filler to hold it together. Quite a memorable treat. 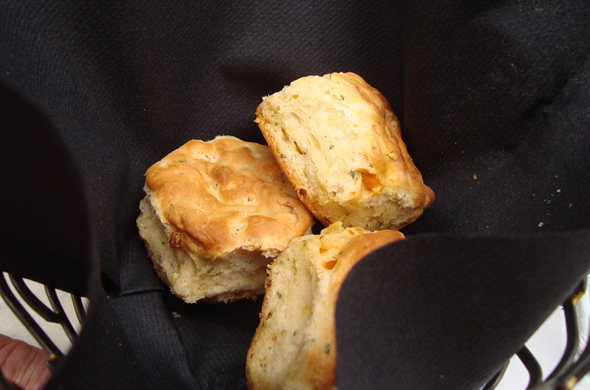 A lovely basket of cheddar and chive biscuits appeared. They were flaky; restraint was needed since dinner was coming. We had never had grits before…here goes. 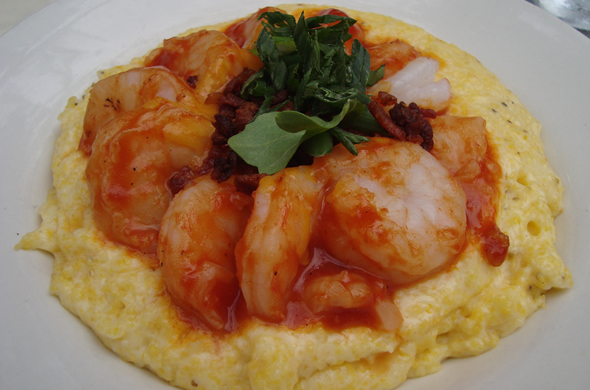 This dinner featured large barbequed shrimp atop grits treated with smoked bacon, cheddar cheese and green onions. Tasty but we still do not know what straight grits would be like. 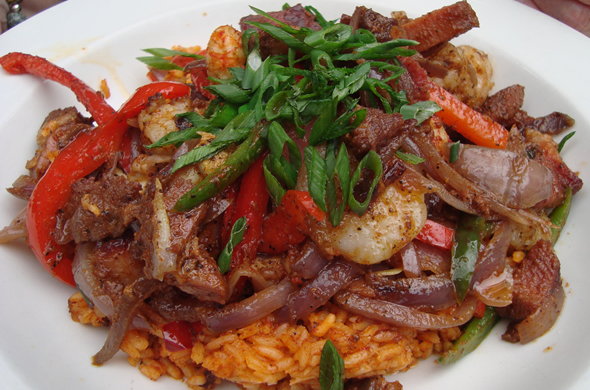 The Lowcountry Jambalaya had both shrimp and crawfish. The waiter indicated that this would be a bit on the spicy side with carmelized onions, a trio of peppers and Carolina red rice. Actually, the dish could have used a bit more spice since the rice was a bit dry. This included Tasso ham had a bit of zing but could have been eliminated. Could there be a dessert menu without a chocolate offering ? Apparently, the owner’s wife makes the desserts and the choices change often. The choice was made for coconut chess pie. Served with a hearty coffee, it was adequate although the crust had a grocery store freezer in its background. 82 Queen was memorable for the pleasant courtyard setting, twinkling lights on potted trees and what seemed to be truly Southern hospitality. 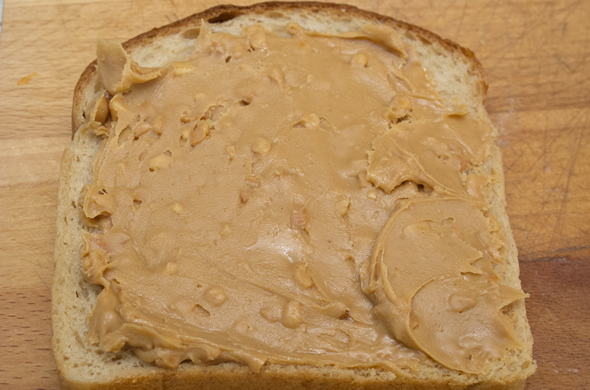 Sandwiches are such a great dinner. 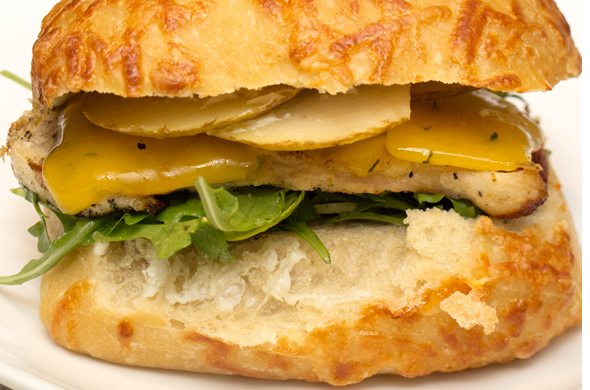 This chicken and pear one is inspired by one that used to be on the menu a Brighton Beer Garden. This sandwich reminds me of my early days in Boston. I found some fun focaccia rolls but any bread would be good, and would make this into a good panini. 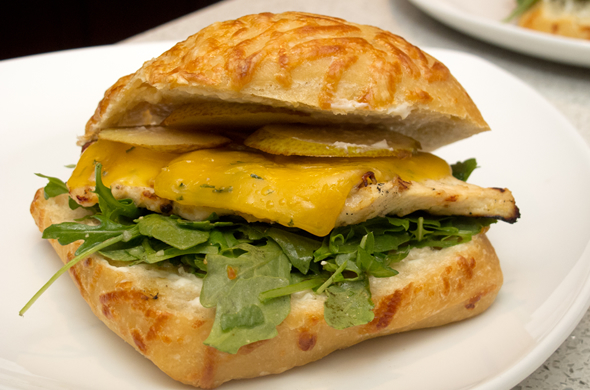 Assemble sandwiches on rolls with arugula, chicken, cheese and sliced pears. 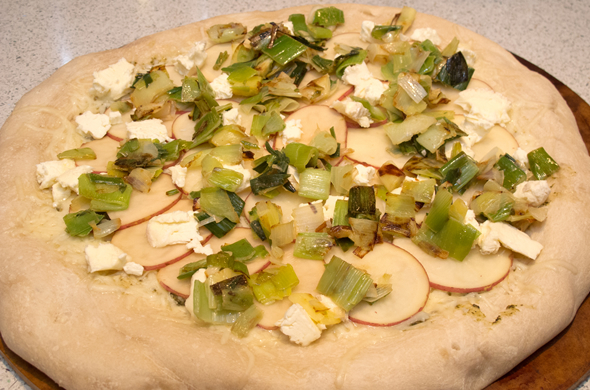 I think the focaccia and the cheese were definitely big parts that made it special. 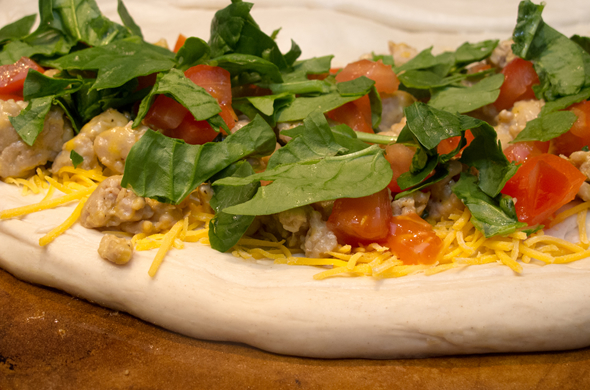 I love arugula and it doesn’t get icky when the hot chicken is on it. I dressed the arugula with a little bit of Italian dressing. Delicious. Arugula is peppery and so good. I’m jetting off to a wedding for less than 24-hours. Sound familiar? Wouldn’t be the last weekend in April if it weren’t craaaaazy. 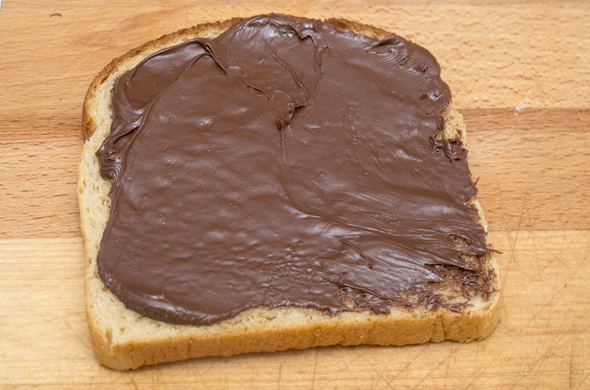 Any dinner panini or sandwich ideas for me during this busy time? 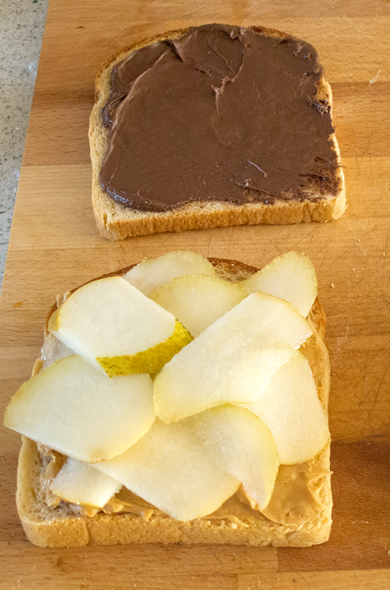 My inspiration for this breakfast treat comes from my nephews. 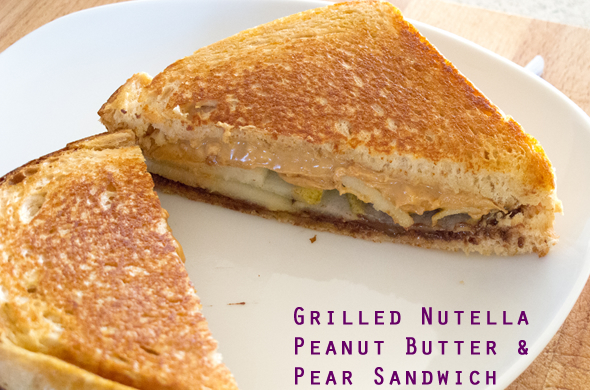 They are peanut butter loving kids and took it up a notch by having their beloved sandwich, grilled. They are so smart. I added some fun touches to make mine a bit more grown up. Today’s What I Ate requires no words, nor does it require directions. I know, I know. There are too many decadent not-springy dishes, but I’ve been a bit backlogged. This is worth it. Maybe we all will keep needing a little comfort here in Boston. The recent Boston Marathon events have shaken me. I work in large scale athletic fundraising events (not as large as the marathon) and it all hits close to home. I’m guiltily reminded that I said a few weeks ago that “this is almost the worst thing that could happen” when one of my sites bumped me for another event. No, that is not the worst thing that could ever happen. I’m mixed between whining that it isn’t fair, that this is a time honored tradition, it is inspiring/impressive/astounding and feeling so badly for people doing a really positive thing. The logistics in me feels for the BAA who will forever be changed. Mr. J works just blocks away, on the same street, and I was just paralyzed by ‘what could be.’ I was so thankful to get home, together, and just process. It was scary to wonder if it was better to stay put or to go to a huge train station. Knowing the cell towers were off made it more nerve wracking. Social media luckily allowed me to see the runners I knew were safe and the event staff I know made it home ok.
Now onto the food. When everything else is uncertain dinner is exactly what I need. I planned to make some really good mac and cheese but I was thinking of topping it with Lay’s new Cheesy Garlic Bread flavored chips, but the grocery store was totally sold out for several weeks. (Yes, this crossed my mind a few times so I gave in trying to make it happen.) Unsurprisingly, there were plenty of chicken & waffle flavored chips? I thought those were too weird, even for me, so I ended up with some interesting looking Feta & Rosemary flavored Cape Cod chips instead. While I was exploring the chip aisle, I knew something healthy but interesting should go with this. Like something green. 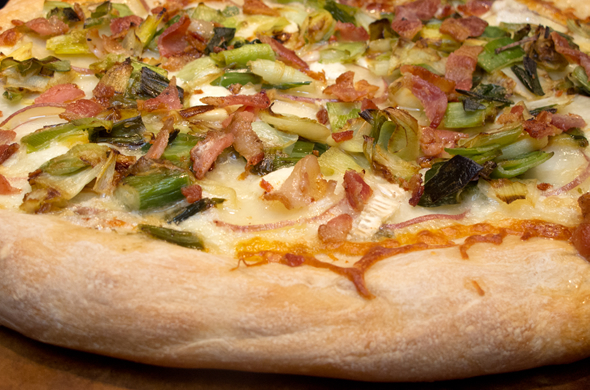 Enter: brussels sprouts! 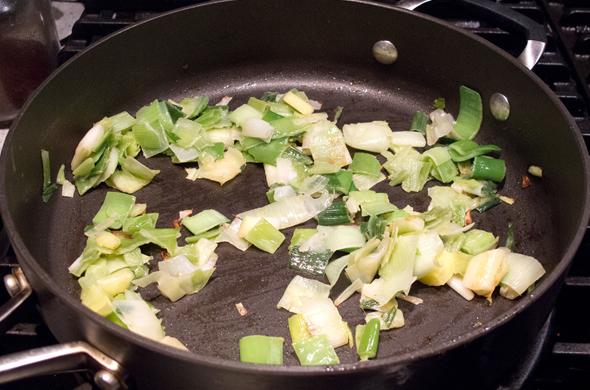 In a flat pan, over medium low heat, melt butter, mustard, garlic, and vinegar for 1-2 minutes. 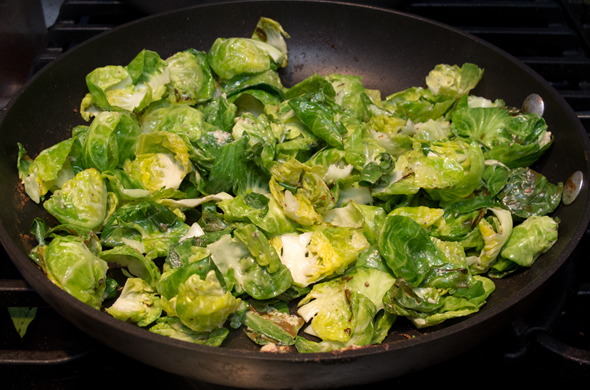 Bring pan to medium and add in the brussels sprout petals. Stir and cook for another 2-3 minutes. 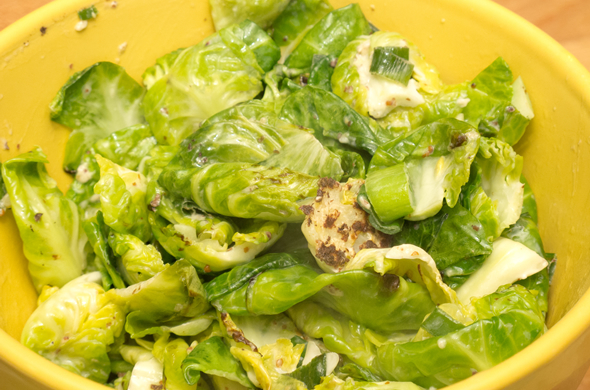 The warm brussels sprout salad has some creaminess from the butter and some tang from the mustard. I think the flavors are light and delightful. 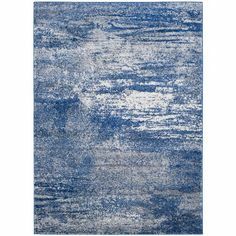 This would go with anything. 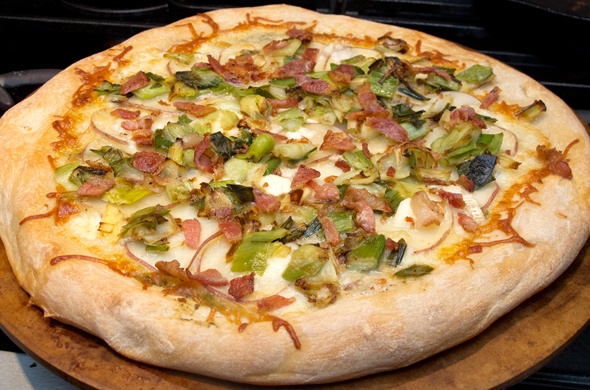 The centers of the brussels sprout is the bitter part so this dish comes out mild and fresh. I think this sauce would be really good on roasted broccoli or carrots too. 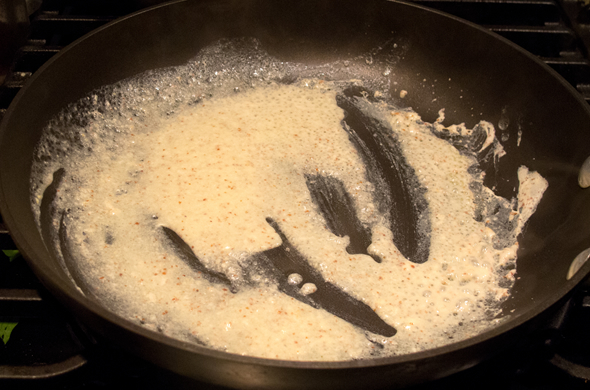 Over medium low heat, add butter and flour to a medium saucepan. 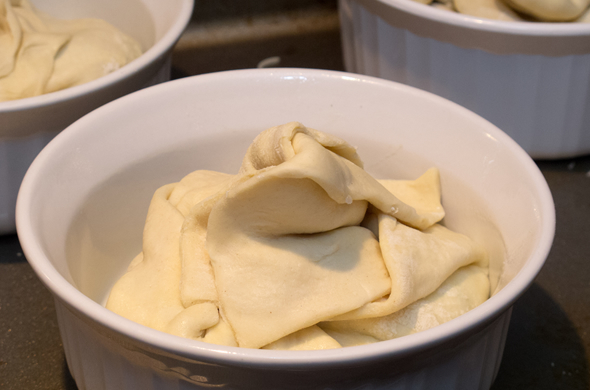 While butter and flour form a roux, let it turn from bright butter-yellow to summer-tan-sandish color to cook the flour taste out. Add milk and cream, stirring to smooth out. Cook pasta to al dente being careful not to overcook. 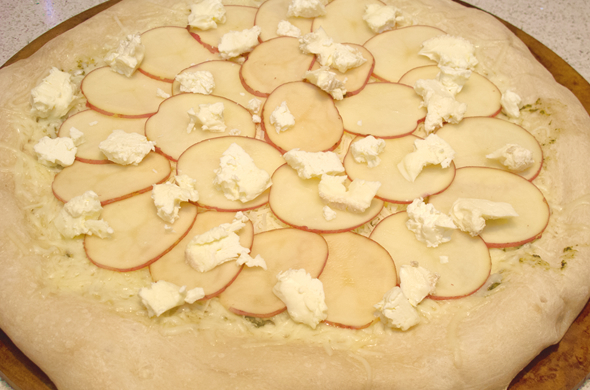 Add cheeses, reserving 1/4 cup of each for later. 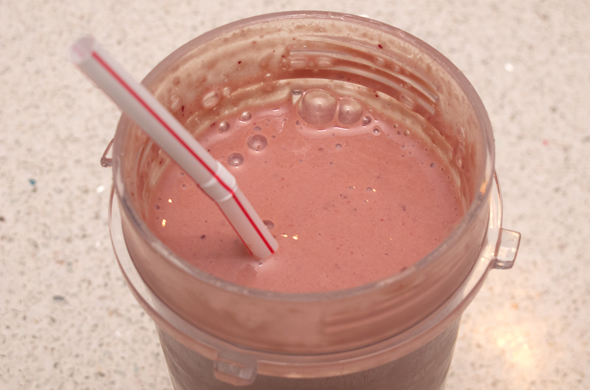 Stir/whisk until creamy and smooth. 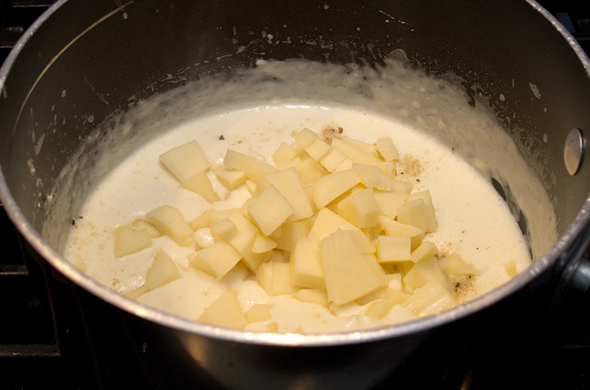 Add drained pasta to the cheese sauce saucepan stirring to incorporate. 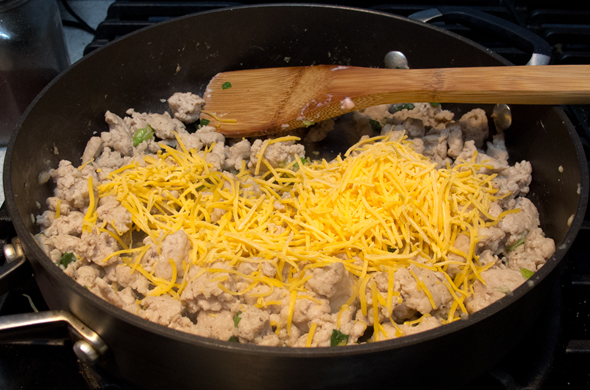 Add egg yolk and remaining cheese (this is where you get some stringy/gooey parts). Top with breadcrumbs or crushed chips on the top. 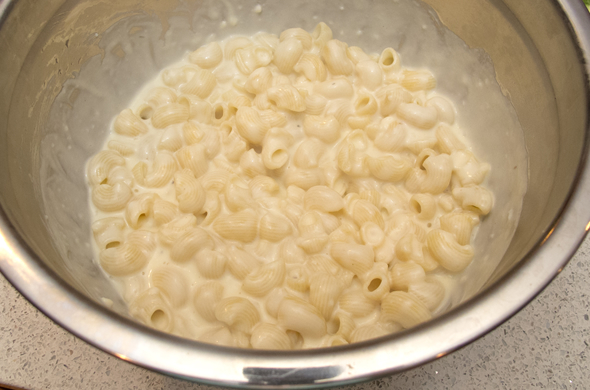 The mac and cheese was so good. 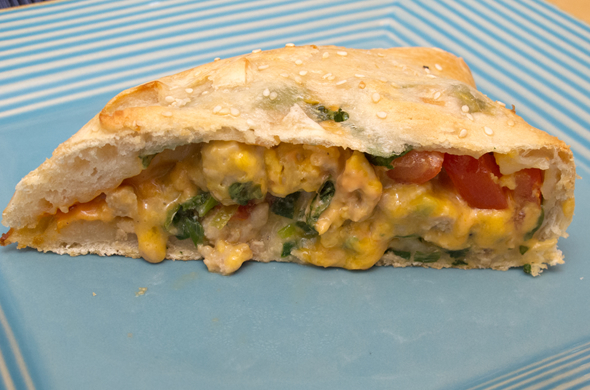 The egg yolk and dynamic cheeses make this creamy and decadent. Sometimes I add a squirt of dijon mustard but I didn’t want it to seem too matchy-matchy to my brussels sprout salad. I love mixing cheeses. Fontina is mild and nutty. 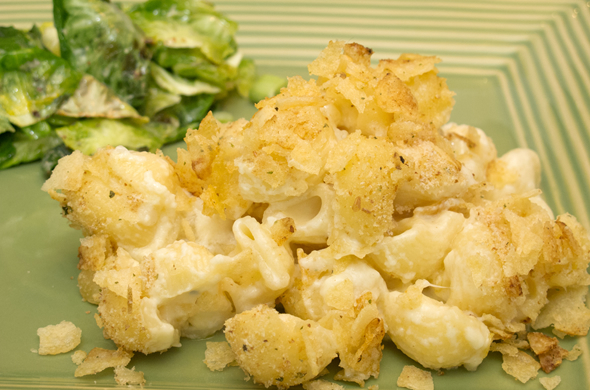 Parmesan adds a subtle saltiness but isn’t the best melting cheese. The chips had a great herby flavor without being quite as fake flavored as it could be. Let’s just let it go that Lay’s decided to make Chicken and Waffle flavored chips. Some things will never be forgotten, but yeah, I think we should all forget that these chips happened. mmmk? 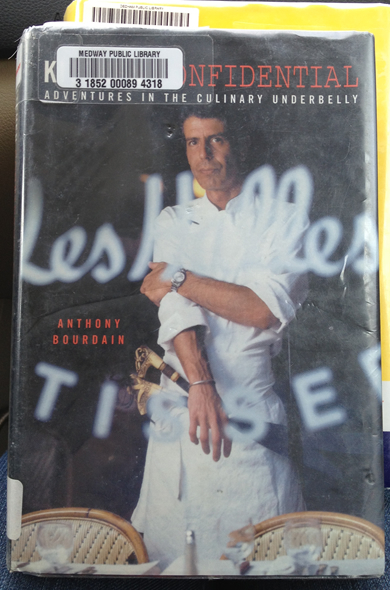 Kitchen Confidential by Anthony Bourdain is my most recent foodie reading. Anthony Bourdain can definitely rub people the wrong way. I have this likeable/badass impression of him. To me, he seems like the kind of person who you wannnnnt on your side and you’ll have his support for life. I also think if you cross him you should just disappear on your own. Do you agree? Is he obnoxious or likable to you? 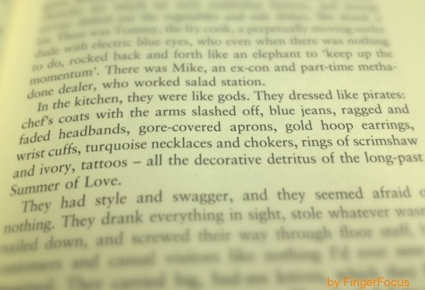 I read Kitchen Confidential and loved it. He writes like he talks! I have loved No Reservations for years and I can’t bear to see him at a judging panel on The Taste, that is not how I picture him. This account of the ‘Adventures in the Culinary Underbelly’ gives some good background to his interesting ways, the lessons he’s learned, and where he’s come from. He writes, travels, and eats. 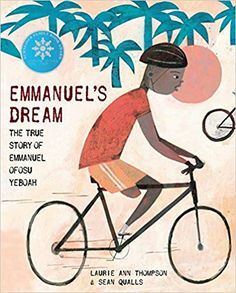 I loved learning that he got his start in Massachusetts! He was trained at culinary school before that was such a thing. He started out so young and so enthused. He has such a way to describe some of those unique moments. I really felt like his first few endeavours were good reminders about growth and progress with successes scattered in. I bet looking back he appreciates those opportunities for what they were, even now that he’s a big shot. I haven’t worked in many restaurants, but the two I spent some time in definitely helped me picture this culture of the different cultures and the hierarchy behind kitchen doors. It is true! A restaurant and catering company I worked at was known for Jewish specialties that the neighborhood swore by. Who made ‘em? A Chilean guy was the only one allowed to make those matzo balls and noodle kugel. The seasonal fried clam and ice cream shack had a group of guys who couldn’t get drivers’ licenses but where somehow all related or connected. Those guys were much harder workers than some of the slacker 16-year-olds who hadn’t ever used a broom before. There were moments when I wanted to cheer right along with what he says. He reminds diners that eating Sunday brunch somewhere that isn’t a breakfast place means the B-team, not the famous Saturday night dinner chef, is whipping up your eggs benedict. Also, that the specials are either something the chef came up with to help with food costs or, it is something the chef would like to move along out of the walk-in before it goes bad. SO TRUE! I think he’s a bit introspective by nature, but I enjoyed that. He dabbled in some intense habits which he references on his shows too. It is probably a good perspective (and PSA) for young cooks who are having that much fun, spending all their money, and who can be great, if they just know what the heck is happening around them. 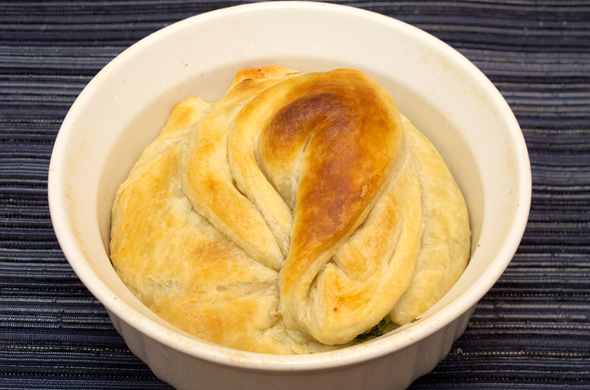 I love creamed spinach as an ingredient. It has tons of flavor and is great for a sauce and for serious color. 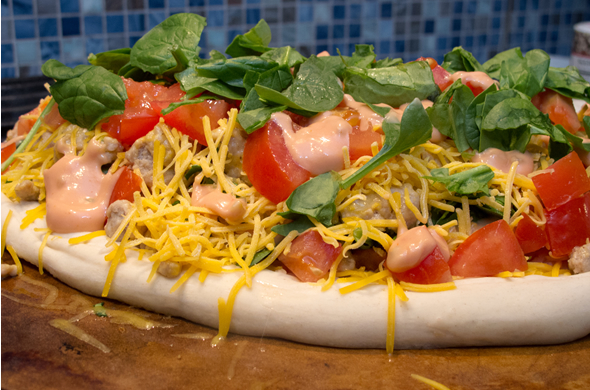 I used it in place of sauce in deep dish pizza. This time I thought it would help make spinach and artichoke dip. 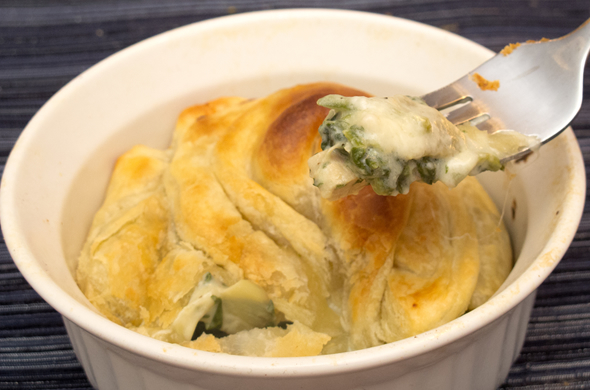 I baked it into puff pastry pockets to turn dip into dinner! 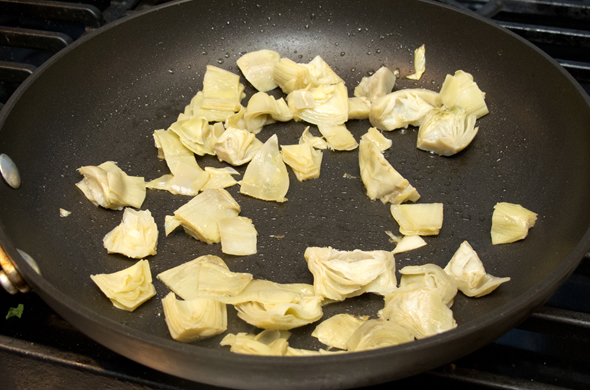 Sautee artichoke hearts in a large pan over medium heat for about 2 minutes. 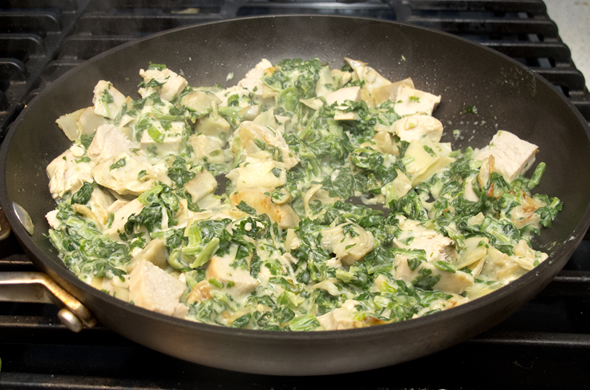 Add creamed spinach, garlic, cream cheese, and fresh spinach to the pan. Stir and cook for 5 minutes. Chop and add pre-cooked turkey/chicken, cooking for another 3-5 minutes. Cut puff pastry into squares. Lay out if forming into pockets. Or lay into ramekins/muffin tins. 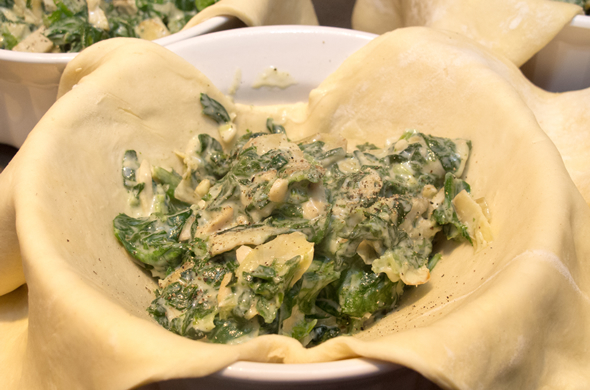 Fill each with spinach/artichoke mixture. 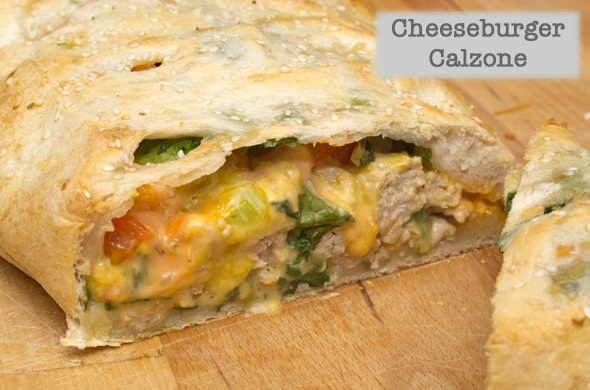 Add shredded cheese and fold/close. This was such a fun and different kind of dinner. I made these pockets into ramekins so I didn’t have to worry if they exploded. Smaller ones would be fun for a party. The turkey I had wasn’t in tip-top shape (it lived in the freezer for a bit) so I figured it’s only use could be cooked into something. 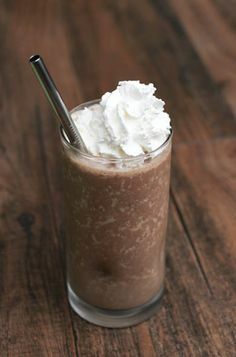 It added a bit of protein but wasn’t a crucial addition. 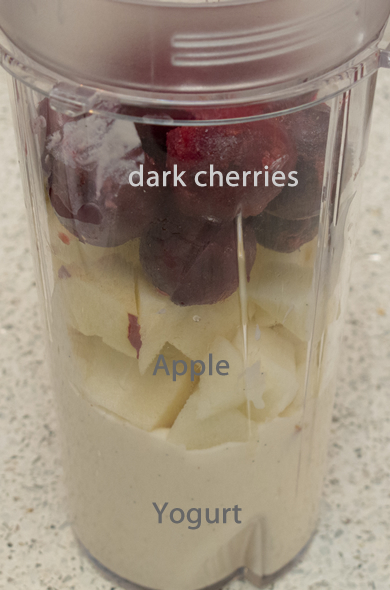 Any other apps turned dinner ideas out there? Today I have a quick restaurant-style dinner. Pan seared scallops are such an easy preparation. They require so few ingredients and cook perfectly. 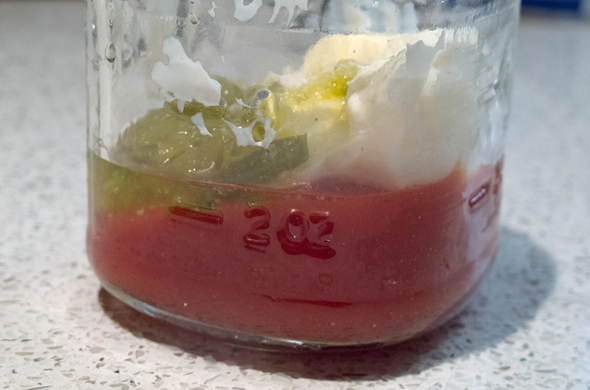 I upped the ante with a really easy sauce too. Heat a heavy pan over medium heat and drizzle with olive oil and butter when warmed. Mix flour, garlic powder, and salt/pepper. 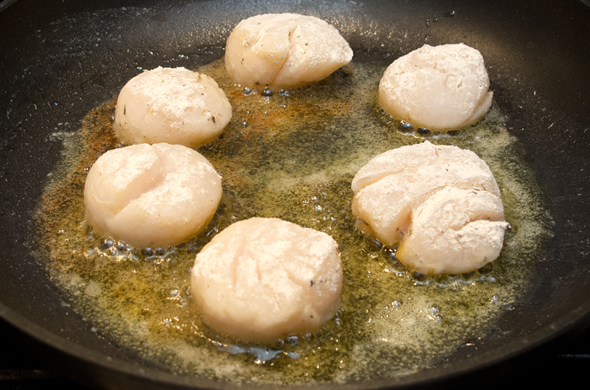 Toss scallops into seasoned flour and sear in the pan for 2 minutes per side. While the scallops are cooking, heat mustard, butter, milk, and cream cheese over low heat. 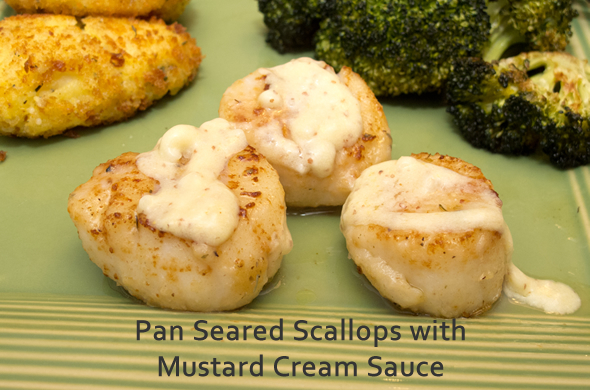 Serve scallops with creamy mustard sauce. The scallops are slightly sweet with a slight crunch on the outside. The butter flavor they are cooked in plays off the mustardy sauce for a subtle flavor. I love scallops prepared this way. They’re easy (as in less than 10-minutes of cooking) and are full of flavor. 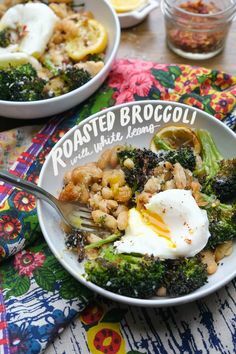 I served them with roasted broccoli and polenta cakes. It felt special for such a simple dinner.